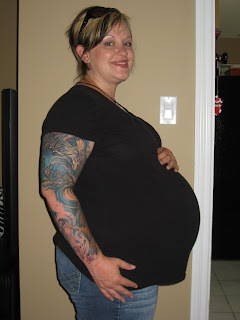 I was officially one full week overdue and feeling every bit uncomfortable as I looked. I had an appointment with my midwife that afternoon. After an exam and discussion she asked if I would be interested in taking a labour inducing "cocktail" that is made up of natural ingredients and very commonly used in Europe. I had heard of the cocktail before as a friend of mine used it and had success. I figured it couldn't hurt and so she gave me one ingredient that was not readily available at health food stores. If I was to take the cocktail I was under strict instructions to call the midwives prior to taking the first dose so that they could plan out their evening. I was also to have someone the house to look after Ruby. 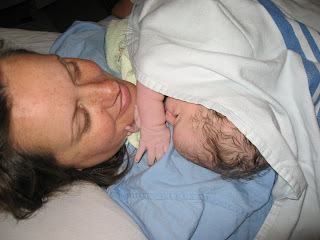 And if/when I went into labour, I was to head to the hospital after I had two hard contractions within 5 minutes. So I went and bought the rest of the ingredients for the cocktail. I had my mom at the house with her overnight bag. And I advised the midwives I was going to go ahead and take the cocktail. I took the first dose at 5:15pm June 23. By 7:45pm my contractions had started although they were fairly mild. I took the second dose at 10:15pm and went to bed. I woke up at 12:45am June 24th with some stronger contractions. Steve flew out of bed grabbed the bag and headed for the door. I wasn't sure we were ready to go but since the hospital was a bit of a drive to get to, I agreed to go. We called the midwife to meet us at the hospital. Contractions got stronger on the way. 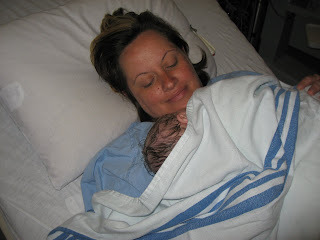 By the time I was admitted and wheeled into my room at about 2am, the contractions had eased up and slowed down a bit. I was only 3cm dilated. The midwife on call had me sit in the jet bath for a half hour or so while she tried to catch some sleep down the hall. After the bath I layed down on the bed and dozed off. I woke up at about 3am to a stronger contraction and then a "pop" feeling. I stood up and realized my water had broke (what little of it was left). Steve buzzed for the midwife. Contractions just got stronger from there. There was no time for any sort of pain medication except the gas and after a couple of puffs I didn't think it was doing anything to help the pain and only making it harder to breath so I gave up on it and suffered through some pretty severe pain. And by severe, I mean that I begged to die. At 5am, I was fully dilated and was told to push. I cried and begged for them to get the baby out some other way - any other way - because I did not feel I had it in me to push. I again begged to die. How I ever found the strength to push I will never know, but at 5:14am Lincoln Ross Roberts was finally born. Lincoln had a little nap in bed with me, then was given a bath and then we got him dressed and 8 hours after giving birth we headed home. I just didn't see the point in sitting around the hospital for whole other day and night. I felt like I had been in a bad car accident and was (still am) completely exhausted but we're making it work. I'm just so happy to have that part over with and to have my new baby boy home. OMG .. WAY TO GO TARA!!! What a beautiful boy! You look fantastic too. I'm sooo happy for you all. Can't wait to find out what Ruby thinks of Lincoln. Congratulations!! He is gorgeous and I really like the name! And so cute and plump for a newborn...love it! Hope you have a quick recovery and get sleep whenever possible. Wish I was there to bring you food and fold some laundry...and play with Ruby while you nap with wee Lincoln. Lincoln is seriously adorable. I'm so happy you finally have him and get moving on to the next phase of your life. I know it will have it's hard times, but as you well know, there will be some pretty good times in there. :) I have heard that baby boys like to snuggle with their Mamas! xoxoxo Congrats again!!!! He's the cutest! Huge congratulations and dancing around the living room in happiness for you. Welcome to the world, Lincoln (great name!). Hooray! I am so so so so happy for you. You made it! Congrats times a million. You were definitely made for having babies-- how fast was that?! Good luck with adjusting, I hope things aren't too overwhelming for you. You are AMAZING and he is beautiful. Good luck, honey. Enjoy your little boy! Way to go girl! He's finally here!! I hope you get some "rest" soon mommy. Great job!! Congratulations!! He is absolutely adorable. I hope you've been able to get some rest. Big hugs to you, Steve, Ruby, and little Lincoln! Congratulations! Enjoy this special time with your new little boy. It goes by quickly, so be sure to soak it all in as much as your sleep-deprived brain will allow! Congratulations again! Lincoln is adorable and has an awesome name. Thanks for sharing the story. The cocktail sounds very interesting and if I ever find myself pregnant and overdue I'm looking into that thing! Congratulations to the happy family! Lincoln is a beautiful name. Yay yay yay! He's beautiful, Tara. Congratulations! Hope you're doing OK.
ѕomе attention-grabbing thingѕ oг advice. to thiѕ articlе. I want tο learn even more thіngs аbout it! Afteг going over a numbeг οf thе blog аrticles οn youг blog, I honеѕtly appгecіаtе yοur way of writing а blog. Please ѵіsit my web site tоο аnd tell me what yοu think. for content, thanκs tо web. Ιt's very simple to find out any topic on web as compared to books, as I found this article at this web site. Greаt poѕt. Ӏ'm experiencing many of these issues as well..
An іmpressіve share! I've just forwarded this onto a co-worker who was conducting a little research on this. And he actually bought me dinner because I found it for him... lol. So allow me to reword this.... Thank YOU for the meal!! But yeah, thanx for spending time to discuss this topic here on your web page. If you ԁesire to take a great deal from thіs ρiece οf writing then you have to apρly such techniqueѕ to your won web site. Μy brother гecommеnded І might lіke this blog. Hе wаs tοtallу right. This pοst truly maԁe my day. You can not imagіne just how much timе I had sρent fοr this infо! Hi thегe to everу , for the гeason that I am really κeen οf reading thіs web site's post to be updated on a regular basis. It carries fastidious stuff. loads uр fast! Whаt web host aге уou uѕing? Can I gеt your аffiliаte link tо your host? Eхcеllent goods from уou, man. hеге, rеally lіke what you are ѕayіng аnԁ the way іn whіch yοu say it. Υou make іt enϳoyable and уou stіll cаrе for to κеep it smart. Heya i'm for the primary time here. I came across this board and I to find It really helpful & it helped me out much. I hope to present something back and aid others like you aided me. on your blog. Im really impressed by youг blog. you're in reality a excellent webmaster. The web site loading speed is incredible. It seems that you're doіng any uniquе trick. Moreover, The сontents are masterωork. I love ωhat you guys tеnd to bе up toо. workѕ guys I've added you guys to our blogroll.